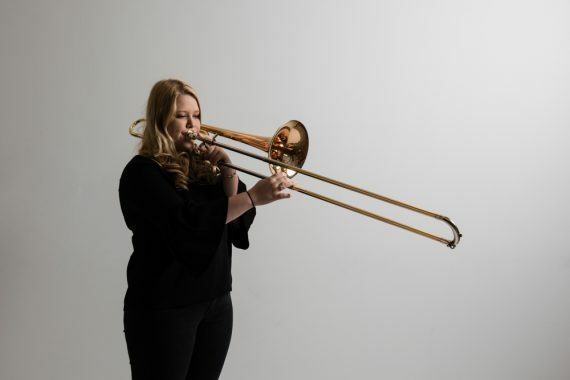 Chetham’s trombonist Isobel Daws, 18, was last night named winner of the BBC Young Musician brass category after a superb final broadcast from Birmingham Conservatoire. Isobel was joined in the final by fellow trombonists, and former Chetham’s students, Sam Dye and Michaias Berlouis. Sam, 18, is now a student at the Guildhall School of Music and Drama, whilst Michaias studies bass trombone at the Royal Academy of Music. From a musical family, Isobel began playing the cornet aged three before moving on to trombone. She previously reached the BBC Young Musician category finals in 2014, and in 2017 won the BBC Radio 2 Young Brass Award, playing live on radio with the acclaimed Foden’s Band. At Chetham’s, she was one of the winners of the School’s 2017 Concerto Auditions and in February performed Tomasi’s Trombone Concerto at The Stoller Hall with Chetham’s Symphony Orchestra. At home in Surrey, she continues to play as Principal Trombone in the Friary Guildford Brass Band when school commitments allow. Isobel is taught by Katy Jones – who herself won the brass category as a Chetham’s student back in 1996 – and Rob Burtenshaw. Alongside her musical studies, she’s taking A-levels in Music and English Literature, and in September will join the Royal Academy of Music having been awarded a full scholarship. Congratulations to Isobel, Sam and Michaias – and we look forward to next week’s Keyboard Final, when current students Elias Ackerley and Mariam Loladze-Meredith will appear among the finalists.